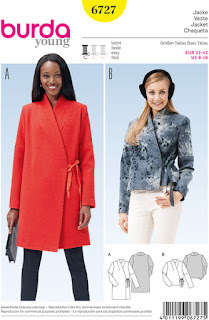 Burda 6727 is an unlined jacket with an integral collar. After checking the finished measurements I choose a size 10. I had to read the pattern instructions a few times regarding how to sew the dart and the collar. The pattern instructions are basic, interfacing is only added to the back neck and the front pattern.. I recommend that you use the instruction only for sewing the front collar, the shoulder seam and attaching the collar to the back neck seam . If you have a good sewing book, this will be the time to use it as a reference. f) The muslin also revealed that I need chest support. I may use this tip from Gertie to add chest support and shoulder pads to the coat. I am please that I took the time to work on the muslin today. Tomorrow I will make the adjustments on the pattern and I will be ready for October 1. I bought that same pattern on my last excursion to Joanns. 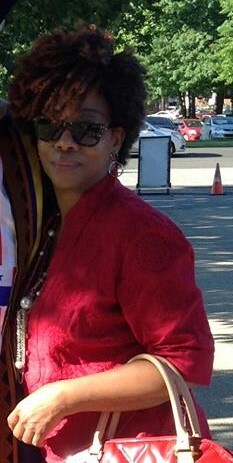 It's on my list of fall coats to make asap. I can't wait to see your version. Thank you Lucy. Once you figure out the connection between the dart and the front collar and the back neckline, it's an easy sew. You are well on your way. I wish you MUCH success! Great coat pattern to start and love the color you are using.